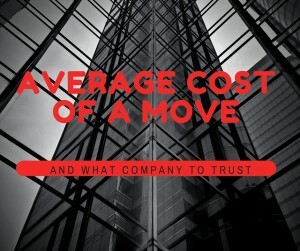 Obtaining moving company prices from local and long distance movers is enough to make one want to do the unthinkable. Hold in there, pull yourself out of the corner of that wardrobe box. 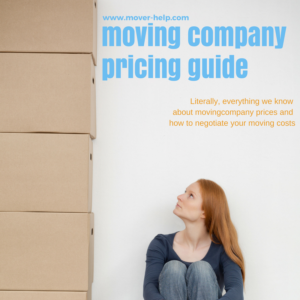 This moving company pricing guide will help you navigate through completely unregulated and obnoxious pricing schemes to help you get the best value for your move. Before getting down to the nitty gritty of moving company prices – you should know a few simple things about moving companies in general. Just like health care professionals or restaurants – there are many different kinds of quality movers. Van lines – Usually priced about 25% higher than private moving companies because the 25% goes to a corporate office. Moving Brokers – Buy, sell, trade, barter your move to independent contractors – usually 5-10% less than private moving companies but you never know who will actually be delivering your items. Private Moving Companies – For the rest of the article, I will be giving you private moving company fees – you can adjust these if you are considering a van line or moving broker. In my opinion, the best value for a move will be through a private moving company. Generally, they have their own trucks, own labor, don’t have to pay a corporate fee and have the best reputations. Full service move – this is where a moving company loads, drives and delivers your shipment. You don’t do any work except packing. All full service movers I know offer packing services as well. price/lb – this is the price per pound that a long distance mover will charge. If you have chosen to a full service mover for your move this will be more expensive by about 10-15% than doing the actual moving yourself. If you are performing an interstate move, then the relocation cost of your move will be based on a few factors: distance your old residence and the new won, time of year you are moving, the amount you are moving. Full service movers charge by weight. I do not suggest getting a price by cubic feet as this adds an additional variable to your moving cost equation. What if your movers load your shipment to take up more space? A quick example – if you are moving from Boston to DC and you have an 2 bedroom apartment your weight will be right around 3000 lbs. The average rate to go to DC from Boston is $.60/lb. So, you would multiply 3000 x .60 – $1800 plus the labor which will average $400 so the total moving company price would be $2200. If you are not using a full service mover, the $400 for labor will be omitted. If you are moving a small amount of furniture/boxes, most local movers have a minimum -usually of four hours. Per DOT and labor laws, movers must pay their workers 4 hours even if they work only two – so essentially movers have implemented a minimum hours per move. So, if you think your move will take less, find something else for them to do – for example, rearranging furniture or bringing items to the salvation army. 2) In most cases, local movers charge on an hourly basis for all moving services. For example, whether they are packing, carrying your household items outside your home, loading these same household goods into the moving vehicle, driving to your destination, unloading your stuff, or carrying all your furniture pieces, household appliances and cardboard boxes over the threshold of your new apartment or house. However, some movers charge differently for different services for example when packing – they charge per box. 3) There is a travel fee for all movers that is usually non-negotiable. However, make sure it is flat-rated. Most private movers and trustworthy ones, have a flat rate of an hour or less. That fee covers the expenses in terms of fuel and time your local moving company needs to reach your home, and then travel back from your second location. If you are in a mood to pack your belongings and box every room, your average moving bill will be much lower than if you choose to have professional movers do the packing for you. Based on my experience in the field, packing costs can be similar to the moving cost itself. A 4 bedroom house can take more than 12 hours to move from one town to another. In this case, your average moving costs will be around $1800-$2500 with no packing included. Anything outside of this range, I would be rather weary on. Either the movers are making minimum wage and won’t be professional or there is so much being taken off the top you are being ripped off. If you are moving from a 3 bedroom 1500 sq. foot home or larger, you really need an on-site or in-home estimate. Your best bet is to have three movers come to your home to estimate and give you moving options. The Distance Between pick-up and delivery. Shipments are priced per pound. Logically, the more weight you have the more expensive it will be. However, weight and price per pound are directly related. As an example consider these scenarios: Boston to Orlando with 2000 lbs is $.75/lb. Boston to Orlando with 7000 lbs is $.70/lb. Date Flexibility. If you need guaranteed pick up and delivery dates – it can get pricy. For example the average fee to incorporate guaranteed pick up and delivery dates is right around $500. Additional Moving Services. The price estimates you receive from reputable long distance movers should include the basic move Additional services will be moving pianos, pool tables, or major items. Other moving services are packing, unpacking, long term storage or overnight storage. Time of Year – The least expensive time of the year for an interstate move is the end of January through April 1. 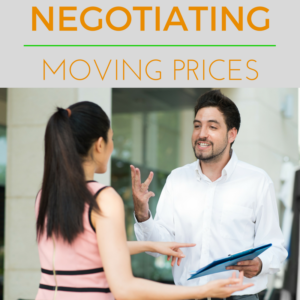 The most important thing to remember here is that the following moving costs are only approximate values that can serve you well to get a general view of what your cross country move will cost you. I suggest using this instant moving cost estimator for any interstate move. It will give you an instant moving quote to compare to other movers. First off – don’t settle for “additional fees.” Additional fees are all costs that moving companies add on top of the bottom line to make additional money off of the consumer. I have seen some really crazy fees as of late such as “interstate optional pick-up charge.” Optional pick up ? The other additional charges that you need to stay away from are: taxes, tolls, stair fee, elevator fee, certificate of insurance fee ( this is FREE through your moving companies’ insurance company), long haul, long walk, mileage charge, interstate move fee, fuel surcharge. Oh, and my favorite – the shuttle fee. This is a fee for a long distance move when a big rig cannot fit in your city/neighborhood and they need to bring a small truck to shuttle it. Find long distance movers that do not charge this fee – it’s a doozy and averages $800! Additional moving fees that are usually not negotiable are overnight storage fees, storage fees in general, fees to move pianos, pool tables, or exercise equipment. Do not get an interstate moving price based on cubic feet. If your movers need/feel like charging you additional money it is easy to load shipments with more/less space. Only get an interstate move estimate based on weight. Weight is not a variable where cubic feet are. Tell your movers that you were referred to them after you get a quote. While working at a van line recently, their data suggested charging an additional 14% to people who have been referred or any corporate relocation accounts because they have found, statistically, that they can still book the move with that kind of a pricing increase. Get the quote first so you can negotiate the moving price and any additional costs and don’t let your moving company know you are going to book them. Be flexible. Moving companies are usually booked the first five days of any month, the last five days of any month, and a few days around the middle of the month. Most leases and closings happen around these dates. If you are flexible – say around the 8th-10th or 18-24th of the month, your moving company will usually have lower rates. If you are hiring additional packing services to your move – don’t let them charge you per box. I have heard that some movers will place a few items in a box which means you will have more boxes and get charged more. Make sure all moving services and charges are detailed and at guaranteed prices. Take only what you need. A move is priced per pound – do you really want to take that pile of wood or bricks that has been sitting in your garage?